Monday always a busy morning as a new week is starting again. 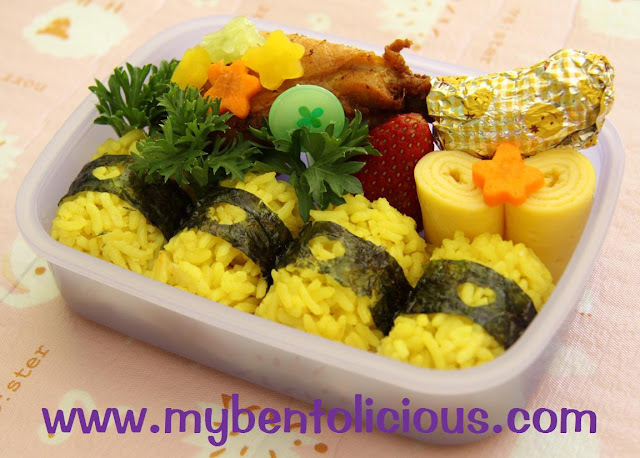 I made a simple yellow rice bento with yellow fried chicken and omellete. Decorated with strawberry, small flowers from carrot (orange), radish pickle (yellow) and cucumber (light green). Punched some seaweeds with heart-shaped puncher and wrapped around the yellow rice. In Indonesia yellow rice is also called 'nasi kuning'. The color yellow itself is from turmeric. The flavor of the yellow rice is very rich and smell nice because of coconut milk and orange leaves or Indian Bay leaves that usually added when cooking the yellow rice.